Soft tops for jeeps are not only for customization; they are actually just as functional as a hard top. With the incredible open-air driving experience that comes with a best jeep soft top, you feel as though you are driving on a bracing safari. 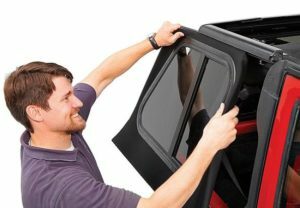 These soft tops come in a variety of styles, making it easy to find the right fit for your Jeep Wrangler. From weather resistance to quality material, you never have to worry about these tops failing on you in even the wettest of climates. Here we will go through the top five soft tops for the jeep on the market right now. We will also be going over what to consider when buying a soft top for your jeep, and we cover how to remove your ragged old one in place of your new quality top. One of the best jeep wrangler factory soft top has to be this Bestop Supertop. It has become one of the more highly advanced kits to for 2007 to 2018 Wranglers. This top comes with superior durability with 135 gauge polyester industrial thread. It is also a complete replacement top made from quality triple-layer black twill that will surpass others with its superior durability. The fabric for this top is not only just wrinkle resistant; its super light-weight at only 30 ounces. You can’t go wrong with a flexible and soft feeling top for your Wrangler. The Supertop even comes with surface heat-sealing and YKK scoop count zippers to protect from even the most extreme conditions. These features offer an amazing cold weather performance and lifelong durability no one can compare to. It also comes with a black powder coating, making it resistant to almost all corrosion or scratches through its life. Not only does it have all these amazing features, but it also is very easy to put together. It comes with quick release bow knuckles. This top even has adjustable tensions at the base plate. The windows this Bestop top comes with are both removable and replaceable. They even come at a 31 percent tint to keep the interior cooler in warmer temperatures. Though that’s not all; if you prefer open-air driving, it comes with an easy open flip-back panel. It comes with high-grade fabric for immense durability, not to mention a hardy appearance. The fabric is made from a vinyl coated polyester marine grade fabric cotton, able to resist any weather that comes it’s way. Not only is it durable, but it also gives your jeep a stylish appearance. The Replay Top also comes with DOT approved windows made of vinyl and heat sealed to prevent leaks. The windows are both rear and side that are a 31 percent tint. Installation of this kit is both simple and able to be done yourself in less than an hour. It snaps right to your original good conditioned hardware without much hassle. This kit also comes with quality zippers that also come with jam-resistant technology. Also with the detailed instructions, it comes with, putting it on will be an absolute breeze. The Trektop Pro Hybrid brings the functionality and versatility of both the hard tops and the soft tops. It is one of the most durable soft tops brands out there, making it by far the best soft top to date. It comes with all the amazing features that you are looking for with a completely hard top. This not only drops the price, but it also gives it a cooler look as well. This top also includes all mounting hardware to get it on with absolute ease and no hassle whatsoever. It also includes door surrounds and a premium twill fabric for a more finished look and great durability through the hard seasons. You can’t go wrong with the windows this top includes. They are super easy to install and remove. There are also some awesome features that are hard to overlook with this hybrid top. The hard rear glass hatch not only allows for easy accessibility with one hand; it also comes with a defroster grid and electrical connectors. This top adds to functionality as well since it easily converts into a Safari Bikini for open-air driving. The Sprint top an economical purchase since all you need is the original door surrounds, windshield header, and the tailgate bar on your Jeep in order to install it. It is not only a cheaper brand by Bestop; it also is just as premium as the top liners Bestop has on the market. This top is one of the best soft tops for jeep wrangler unlimited at the greatest price. This economical choice also comes with a three-year warranty to save you from having to fully replace it if something happens. With it being frameless, it doesn’t come with that overbearing and hard to install top bow. It also comes with a large flip-back panel for optimal open-air driving opportunities. The windows are also removable to make the entire jeep open to the bracing winds. Though it is frameless, it still offers a great weather resistant top that fits snuggly into your own hardware. With it fitting so snuggly into your hardware, it also cuts down the noise of traffic just like a hardtop would. Also, with its zipper, it really ensures everything is tight to prevent weather breaching any time of the year. Smittybilt is a quality replacement top that can completely replace your old and worn out top. This is one of the best replacement tops since it makes your Wrangler look almost brand new. It even comes with two front replacement door skins and removable windows, allowing it to fit your tastes. Not only does it look great, but it also has amazing durability with quality materials. The seams are heat sealed and the threads are 135 gauge which prevents mildew from forming on the fabric. It is even able to resist fading or stretching with the OEM style fabric. The thread is top quality, and Smittybilt claims to be the only manufacturer to use this type of quality in their soft tops. Since this replacement top fits your original hardware and framework, it makes much easier to install. The windows are also zipped in with self-correcting zippers that make amazingly easy to remove or replace them whenever you wish for a more open-air experience. There are major differences between both the hard and soft. When looking for a jeep soft top to buy, you must know what would work best for your style and functional needs. The hardtops have plenty of different traits that most soft tops do not. They are super durable and even have great insulation to help fight against the cold weather. They even have better noise cancellation. However, they can be cumbersome with their heavy frames, making it impossible to replace without friends to help. Soft tops are way lighter and easier to replace by yourself. They may be a bit noisier while driving, but the awesome look of these tops makes it worth it. It also gives an awesome open-air experience through the warmer months. Though they don’t quite hold up in colder climates since they are unable to insulate the cabin from the freezing temperatures. The difference between framed and frameless tops comes down to whether it has an aluminum frame or a series of rails. They both still support the fabric material on the top, though the framed gives it a more taut look while frameless tops are a tad more flimsy. However, the frameless tops offer a much easier way to load and unload your items without the frames in the way. For long summer seasons with the sun beating down on your soft top, it is important to buy one with top quality materials. It is known how fast soft tops break down through long summers, so having quality material can make all the difference. Though if your summer months are shorter than average, quality may not be an initial concern since it is used only a few months out of the year. This allows you to buy a cheaper option that will last as long as a quality top in warmer climates. Do you want certain features with your soft top? Such as windows that are removable? Flip-back panels? There are many different tops that offer a number of features. It is best to follow your own style to make your jeep rocking for you. Though some rare but awesome features should be considered when buying a top. Such as a top that electronically rolls back or even Bikini tops for a safari look. Who doesn’t want that? Unzipping and removing all the windows are the top priority. This makes the soft top easier to grab and remove without thick pieces holding it in shape. Make sure to set them out of the way of anyone that may come through, and set padding or material between them to ensure they don’t get scratched up. Next, you must undo all the clips and unlatch it from any foundations or frame. Slowly lower it from the jeep and fold it neatly. You can even use bungee cords to keep it together. Now, you must take out the two Torx bolts. This allows you to separate the Jeep’s roll cage from the tubular frame up top. You can now pull the top part off and put it away with the other parts. You are now able to put on your awesome new top! If you have a soft top with a frame, this where you should start. Get it all aligned and locked into place both up front and on the rear runner. Carefully put the material up on the frame and make sure everything in place before you secure it. Make sure the plastic runners are snuggly in their sockets to keep from moving. After you secured the bottom rear, now go from the upper middle and secure to the frame. It best to get in the jeep to do this. Now you can install the windows with the window retainers and zippers. There are often two retainers and two zippers for each side to make sure in place. Though the back window often requires a larger retainer bar and more zippers. Now that everything is in place, you can enjoy! Now that you have not only seen our suggested jeep wrangler factory soft top, an informative buying guide, and even how to remove and install these tops; you can now make an informed decision. Though the best jeep soft tops we suggested are the best in the market right now for a variety of jeep wranglers. From the frameless to the hybrid, you can’t go wrong with any of the ones in the list above. They come with amazing functionality and quality materials that will last longer than most soft tops before them.